Toilets must be cleaned, and the required amount of work depends on its design and the materials and methods employed. 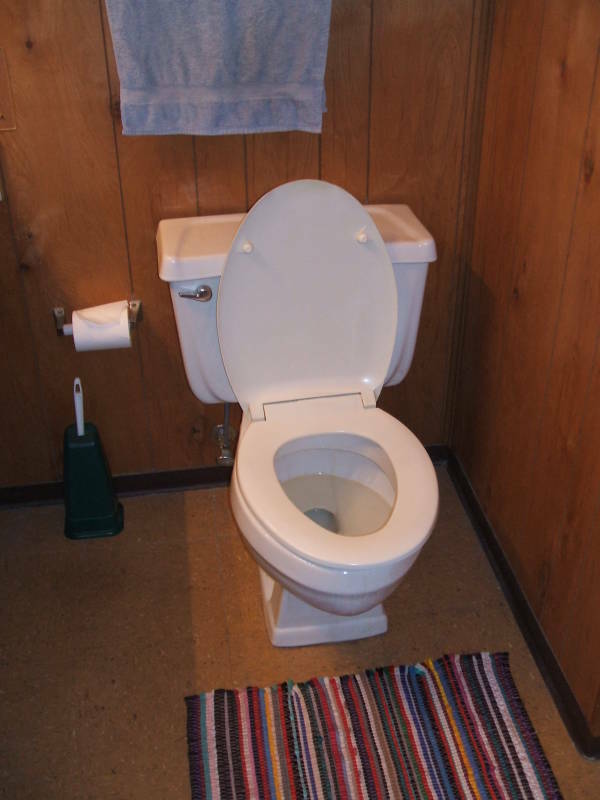 Squat toilets can be much easier to clean, and seatless toilets have significant cleanliness advantages. The seat itself is often made from materials that are intrinsically much more difficult to fully clean and sanitize. As for the cleaning materials, the chemicals frequently used can be hazardous in isolation and extremely dangerous if combined. This has led some people to suggest cleaning the toilet with fire, although my experiments in this area suggest that it is far more trouble than it is worth. Squat toilets have an advantage for cleaning, as they usually are similar to a shallow sink set into the floor. You can go at them with a mop and a hose. Raised "throne-style" commodes have a rim that provides a likely place for mold to grow. Removing the seat gives you a cleanliness advantage. The body of the toilet is a bowl made of vitreous (glass-like) material. It's extremely hard and non-porous, meaning that it gets less dirty in the first place and can be cleaned with harsh chemicals and vigorous scrubbing. The seat, on the other hand, is plastic or painted wood and is somewhat porous (even more so for wood, especially in the case of seats that have been in service for a long time). The seat itself gets dirtier and is harder to clean. The area around the mounting hinges is even worse. One of the most frequent uses for harsh household chemicals is the cleaning of bathroom toilets. The chemicals can present a danger to children and pets in the home. Mixture of these chemicals makes things even worse. You can produce hazardous chloramines by mixing ammonia with household bleach (a solution of 3-6% sodium hypochlorite). Do not carry out this experiment! NH2Cl, a hazardous chemical easily produced in the home. Chloramine is being used increasingly by municipal water systems to disinfect water. Chlorination, the addition of chlorine gas, has similar disinfecting characteristics. However, chlorine can form byproducts including potentially carcinogenic trihalomethanes and haloacetic acids. Chloramination, the addition of chloramine, can also form these byproducts plus N-nitrosodimethylame, but all at much lower concentrations. Do not mix ammonia and bleach outside an appropriate laboratory setting with adequate safety precautions. 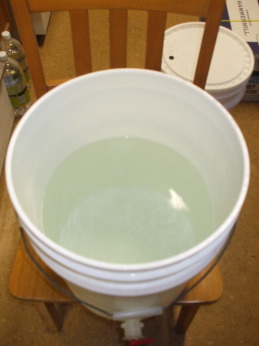 Chloriminated tap water in a white polyethylene bucket. Water treated with chloramine has a green tint. This tint is so strong that you can observe it by filling a large white polyethylene bucket with chloraminated tap water. A toilet possibly in need of flame-cleaning. A company selling "natural toilet cleaning products" told me that some authorities claim that a toilet is not clean until it has been flambéed with alcohol. 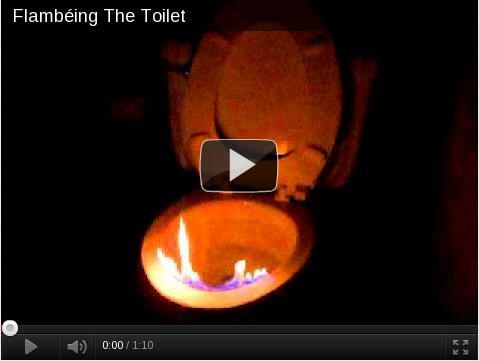 Flambéing is the process of applying alcohol or other volatile and flammible hydrocarbons to the inside surface of your toilet bowl and lighting it on fire. Even as the Toilet Guru, I don't know who these authorities might be. But as you can see in this video, I was interested enough to have tried this personally. However, the procedure is more trouble than it's worth. As you might imagine, a water-filled porcelain object is not the most conducive base for a brisk fire. While that's good in terms of the potential fire hazard, it's quite tricky to get the thing to light on fire and even harder to maintain a useful flame for any period of time. Part of the frustration is probably due to drugstore rubbing alcohol typically being no more than 70% isopropanol, with the remaining 30% being water! I have concluded that flambéing is not really worth the trouble outside of special occasions, especially since properly cleaned toilets can have fewer bacteria on their surface than the nearby wash basins. This, of course, assumes that the wash basins have not also been flambéed. Certain cleaners meant to be put in toilet tanks contain bleach and other caustic chemicals. They keep the bowl sparkling, and they give the water a blue or green tint so you know to replace them when it turns clear again. For practical reasons, these tank tablets are not available in yellow.